Raiders' Dave Priestley (#70) scored a goal and was named MVP. Match Officials: Josh Humphreys, Matt Humphreys. The Widnes based Riverside Raiders team narrowly lost out 6-7 in a thrilling and highly entertaining challenge match against the Telford Spartans at Silver Blades Widnes on Sunday. This was a welcome break from the rigours of the competitive Summer Classic competition which they take up again next weekend and was just the sort of the test they needed ahead of the latter stages of that event. The game was played in good spirit throughout and was closely contested. The Raiders opened the scoring in the 5th minute with a great strike from Owen Tennant, assisted by Sam Plant. The lead did not last long, however, as Telford equalised some 4 minutes later and then edged ahead with a second strike on 13 minutes and the score remained 1-2 at the first break. Despite being numerically inferior – having only travelled with 9 skaters and one netminder – it was the Telford team who were quicker out of the blocks for the second period and they extended their lead with two goals within 90 seconds of each other - at 24.18 & 25. 57. The Raiders finally managed to rally and pulled one back through Eemeli Vuorihovi but two more quick fire goals from the Spartans with 10 seconds of each other around the 33rd minute mark left the home side with a mountain to climb in the final period. At 2-6 down, the Raiders needed a special period to turn things around and it got off to a great start when Anthony Hughes poked in a loose puck after it had been fumbled by the Spartans’ netminder on the goal line just 46 seconds after the restart. More goals followed - from David Priestley (43.48 - asst Plant & Donkin) and Jack Walker (47.23 - asst Birtwistle) and, with Telford visibly tiring through lack of numbers, it looked as if a comeback might be on the cards. 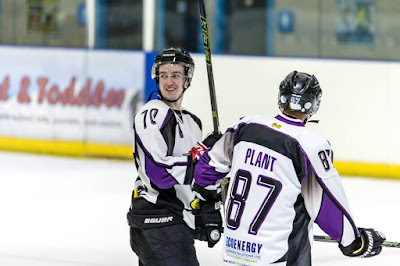 The Spartans called a time-out at 49.33 and that may well have won the game for them as it completely interrupted the Raiders’ momentum and Telford came out looking revitalised and went on to score their 7th goal. With just under 10 minutes to go, there was still all to play for and the Raiders pulled a goal back at 54.09 through Owen Tennant (asst Sam Plant). The last 5 minutes were incredibly tense as the home side pushed forward trying to score an equaliser while the Spartans battled doggedly to keep them out and also threatened the Raiders’ net on several breakout opportunities. The resulting 6-7 scoreline will have been a disappointment to the Raiders who played well overall but just let the Spartans edge too far ahead in the second period to be able to rein them in. The Riverside Raiders are away next weekend when they play the Blackburn Buccaneers at the Silver Blades Arena in Blackburn. They play their last Summer Classic group game on Sunday 23rd July at home at Silver Blades Widnes. Face off is at 4.30pm and admission is free. The Widnes Wildcats are in home action a week on Sunday (16th July) when they take on the Hull-based Kingston Cobras in the Summer Cup. Once again, face off is ta 4.30pm and admission is free.